We think about privacy yet intimacy with the nature whenever we plan to have our vacation home. But sometimes we may never know that we can also have this even in our own residential houses. We may not need another vacation days just to feel the real comfort and peace of mind that we are looking for. Yes because all of these features may be applied in our houses. Today let us check how the designer made this residential house into a private and charming house. 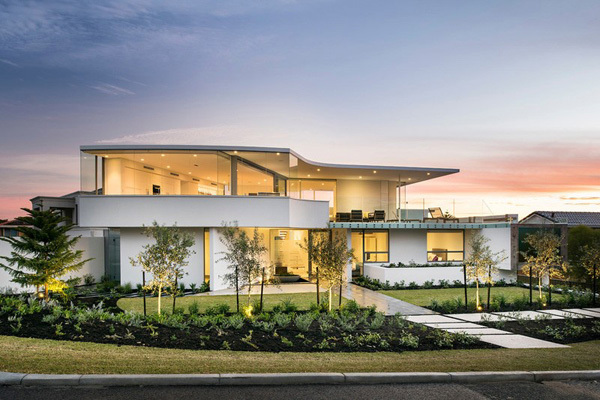 This house is named as the City Beach House as its name was derived from its location. 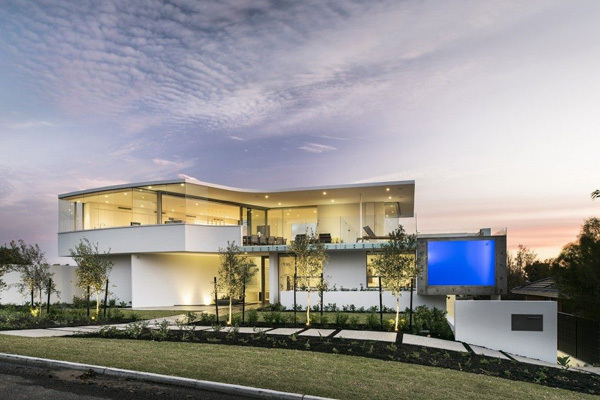 This house has exposed its clean lines and minimalist aesthetic. 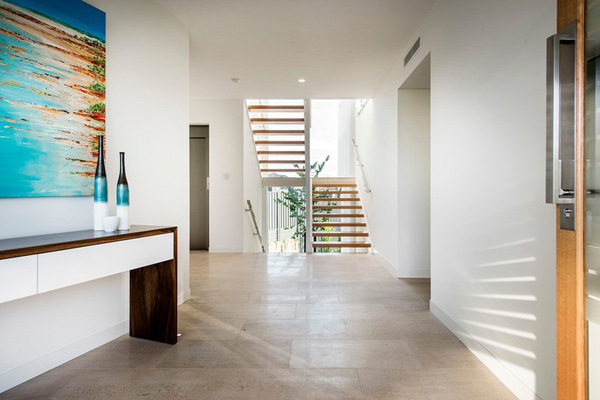 While there’s a distinct resort feel to this home design because according to the designer this house is created to complement the sweeping coastal views and the extraordinary surroundings accessible in the City Beach block. Let us take a look at the different areas of the house through the images below. Enchanting lights perfectly harmonized with the plants and beautiful landscape in the front area of the house. Take a look at the well-trimmed plants surrounded the exterior of the house that adds elegance and sophistication. Smooth and quality materials utilized in the house building is underline from the exterior and entrance. 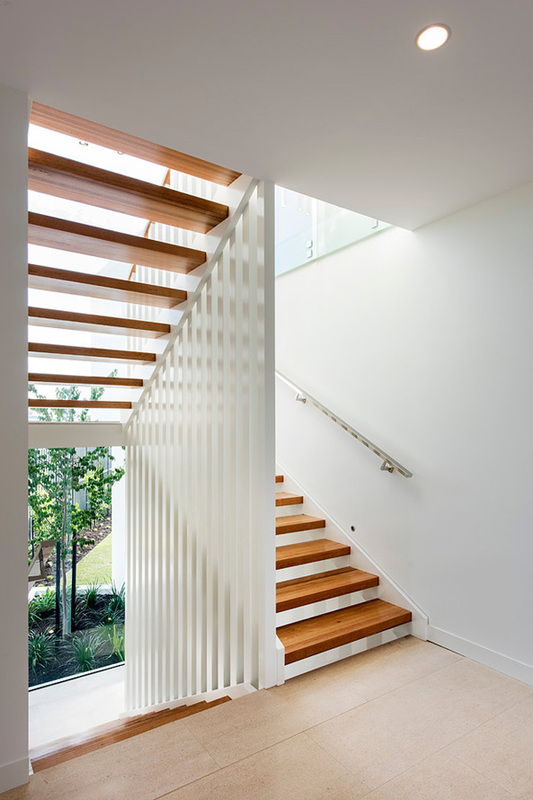 Wooden colored staircase match with the plain white walls and floors here. 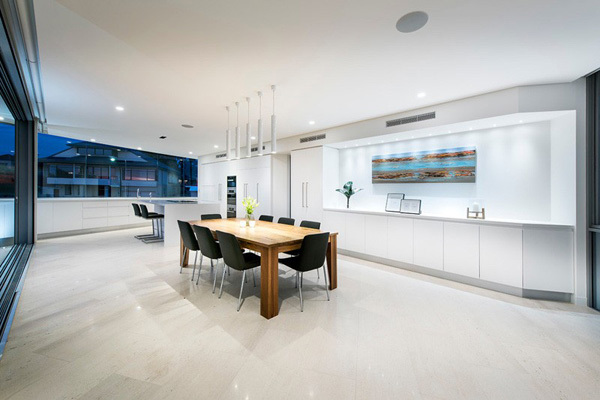 Different accessories and furniture enhances the look of the plain white themed interior. 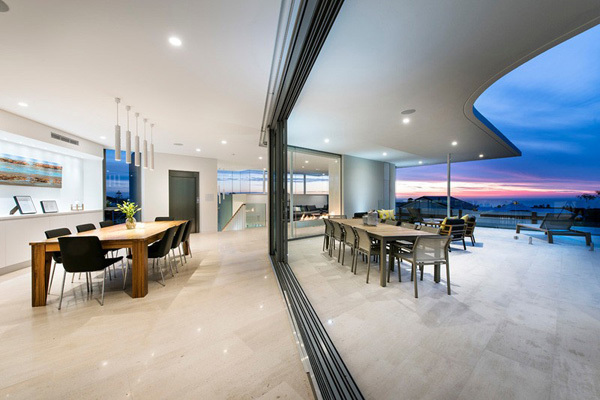 Glass material provides a high advantage of accessing the exterior from the indoor spaces. 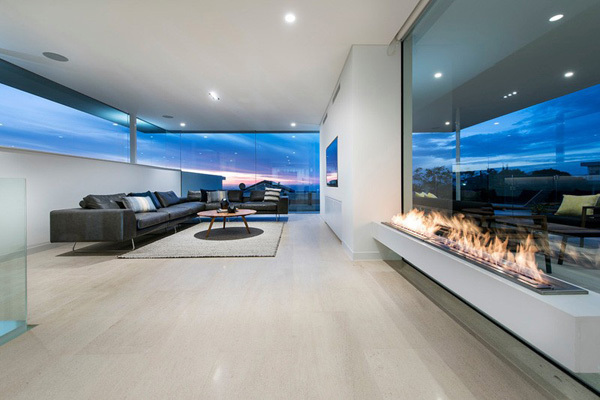 Modern fireplace installed in the living space also emphasize its trendy and stylish concept. Large and simple dining table set in the interior also jives with the table set in the patio area. 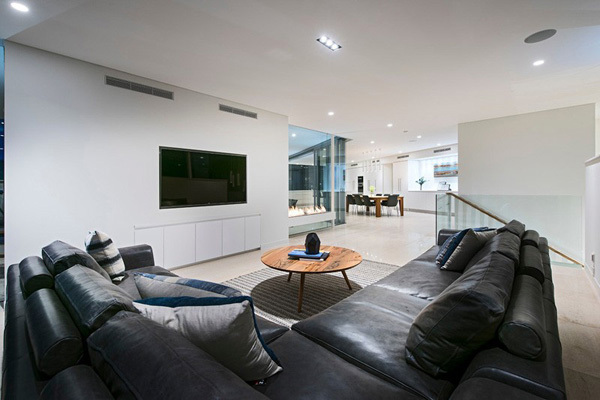 See how these black sofas harmonize with the white themed interior and modern equipment here. The shapes and curves seen in the dining area also complements with the simple kitchen here. 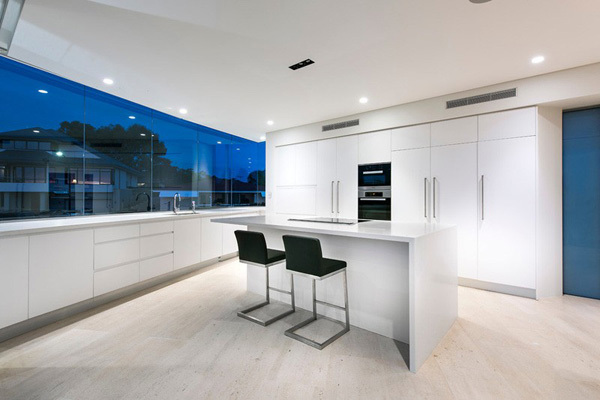 You may be attracted on how the designer utilized the white palette and glass themed in this kitchen space to make this comfortable. 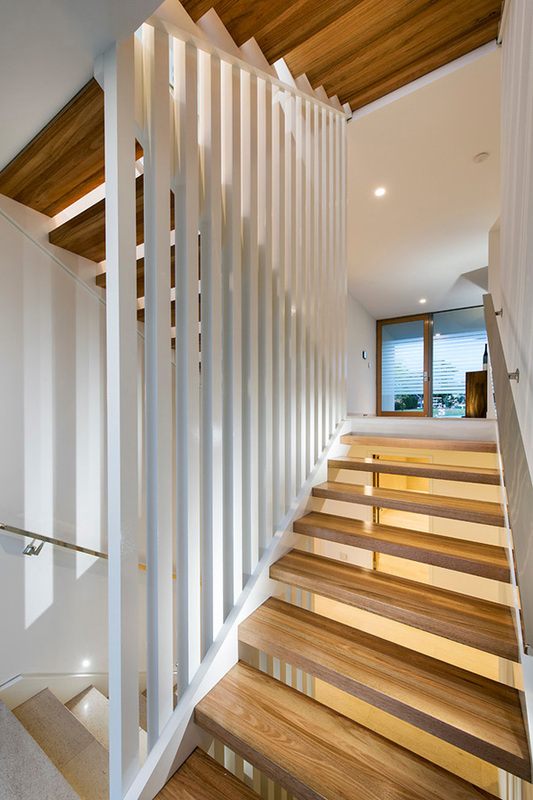 At night, the installed lights in the staircase area underline the luxurious and contemporary design of the house. 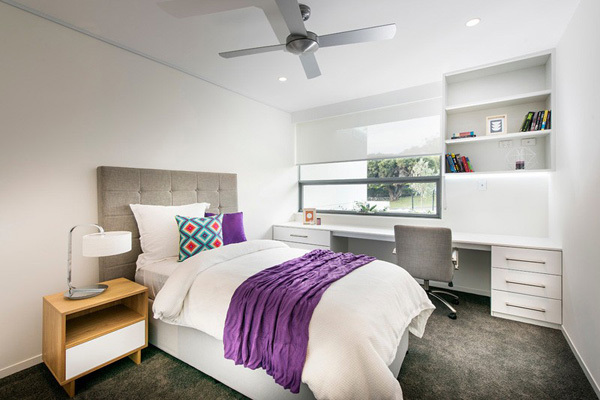 Purple and grey color in this white bedroom creates a very classy and cozy space. 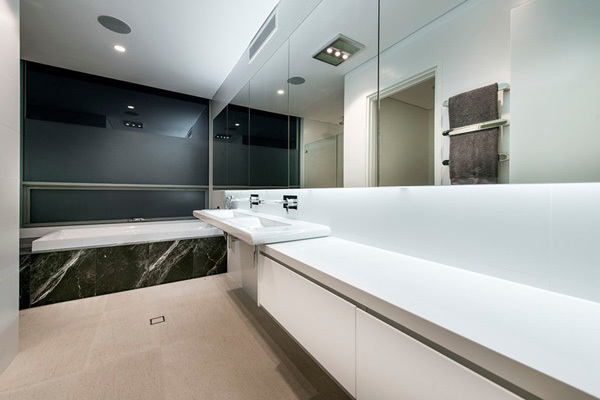 Trendy fixture match perfectly with this clean and neat tiles and large mirrors. 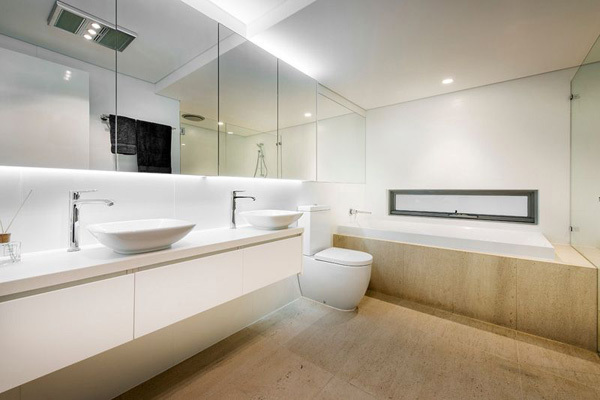 Another bathroom in the house that shows simplicity and neatness. 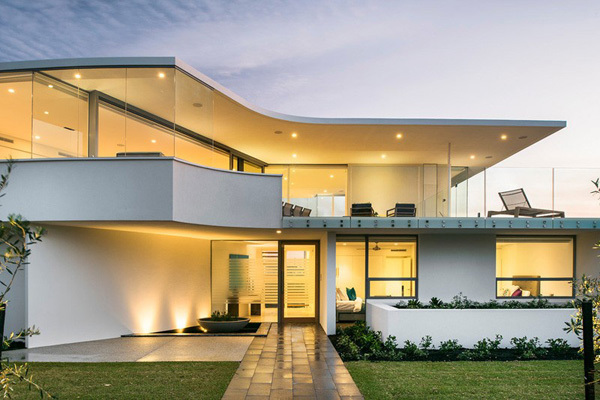 As we can see the different angles and structure of this city beach house, we can definitely say that the Cambuild together with Banham Architects has successfully made this house in the beach area. The client may certainly feel the peace and free from stressful day in their work place. The main goal of designing the house that is capable of embracing the vistas and the northern light, while providing the privacy from the street, the client achieved it. We are at certain that you enjoy the details of this house that you may as well apply in your own house in the future.